Adventure is out there! - Jack Does Good - Visual communicator on a mission to do good well. On July 14, 2010 by Jacklynn // my day. 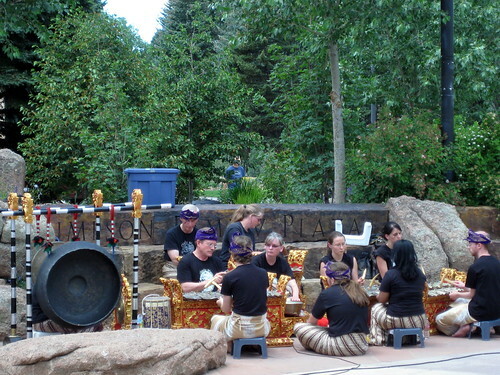 02| Balinese music in the plaza performed by the Wyoming Gamelan Chandra Wyoga. 03| Road trip to a go swimming. Isn’t Wyoming’s vastness beautiful? 04| Swimming in an ice cold lake! Honestly, the water was about the temperature of refrigerated water and it was only about 72 degrees outside. But we had to go in! It’s amazing what your body can acclimate to. ….And today was no exception. After we did the little up-and-down part (“rhythms”?) we went to the big side. I tried to jump a table and it resulted in a major crash which tore up my legs and arms. And a suspiciously painful bruise on my arm. Still worth it! I had gone off it before, but I tried to get some air without having a plan of how to land after said air was got. Lessons learned I guess. 06| Dinner. Pasta, chicken marinated in red wine served with spinach and prosciutto. Mmm. Future plans: New York & Baltimore with Katie, Bob, and Igor?! YES PLEASE! Hope you have a great summer too. And yes, I was totally thinking UP with this title. Go out and live while the living’s good!